Click the photos to view each of the wine-themed candle holders up-close. 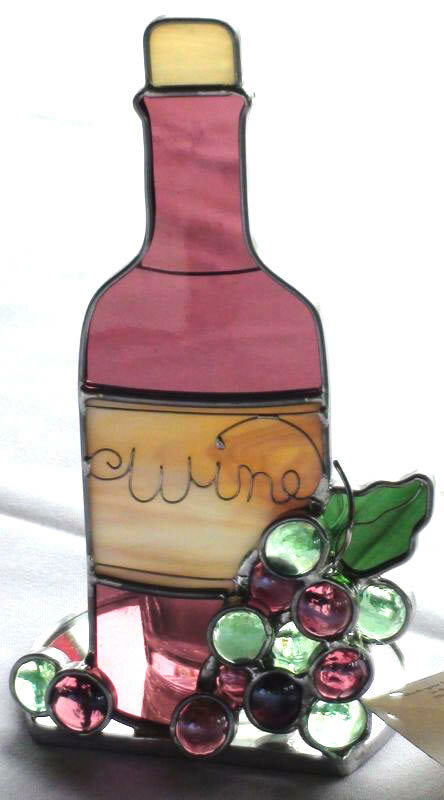 Description: This leaded stained glass wine bottle surrounded by grapes stands on a 5 inch circular mirror base in front of a votive candle. The bottle and grapes measure 7.5 inches high by 4 inches wide. The amethyst wine bottle with amethyst & green grapes back lit by soft candle light is perfect for wine lovers or any wine themed décor. The word "wine" is written on the label with wire. A companion piece to the standing candle is the hanging wine bottle and grapes. 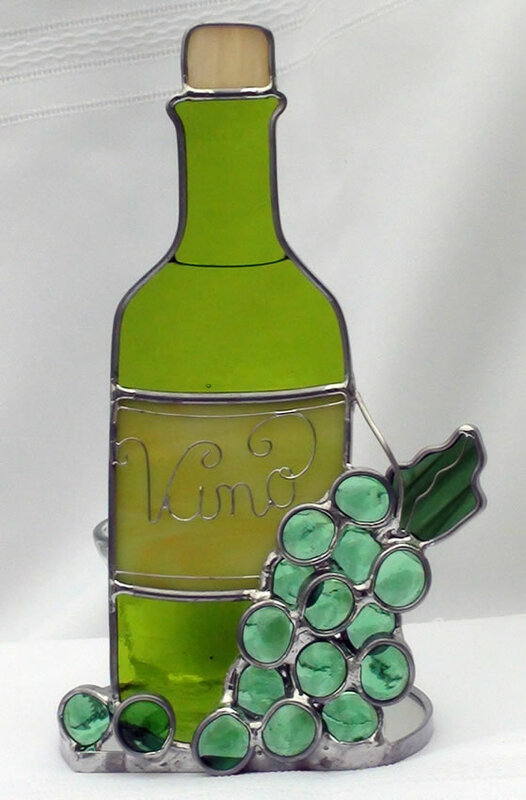 These items are also available in green and the word "vino" can be depicted in wire on the label. Find these items in other listings. Description: This leaded stained glass wine bottle surrounded by grapes stands on a 5 inch circular mirror base in front of a votive candle. The bottle and grapes measure 7.5 inches high by 4 inches wide. 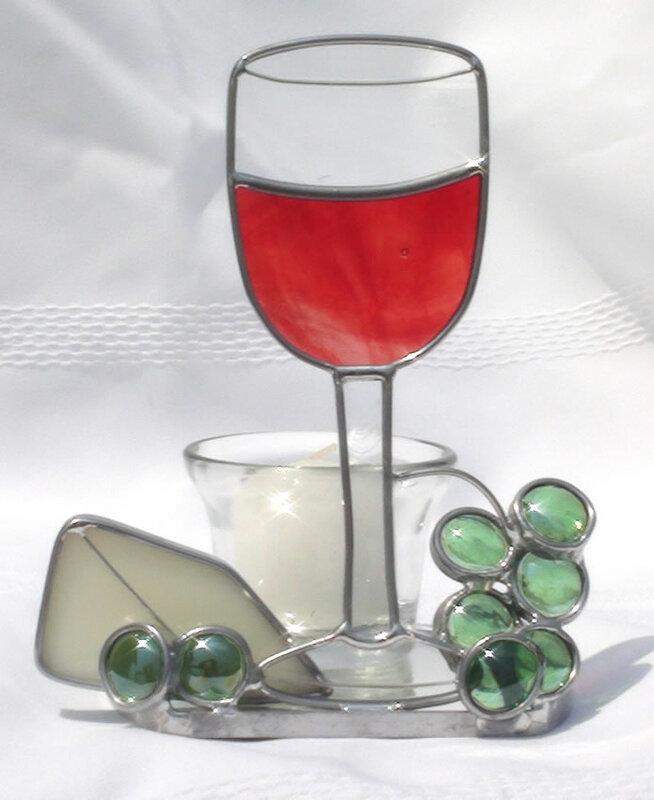 The green wine bottle and grapes candle is perfect for wine lovers or any wine themed décor. The word "wine" is written on the label with wire. A companion piece to the standing candle is the hanging wine bottle and grapes. 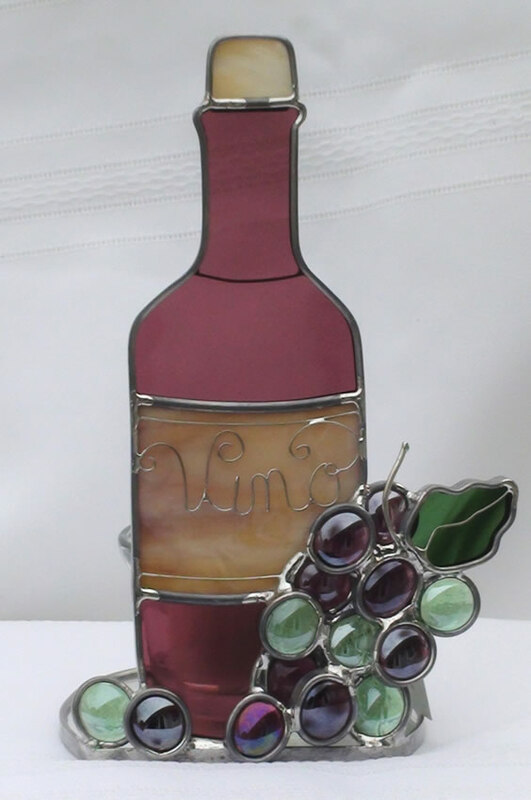 These items are also available in amethyst and the word "vino" can be depicted in wire on the label. Find these items in other listings. Description: A leaded stained glass stand up piece measuring 7.5 inches high by 4 inches wide sits on a 5 inch circular mirror base with a votive candle. Depicting a wine bottle surrounded by grapes and back lit by soft candle light it makes the perfect gift for wine lovers and compliments any wine themed décor. The bottle is amethyst with green and amethyst grapes. The label is decorated with the word “vino” in wire writing. A hanging companion piece is available in a separate listing. These items are also available in green and the word “wine“ can be written on the label. Description: This leaded stained glass wine bottle surrounded by grapes stands on a 5 inch circular mirror base in front of a votive candle. The bottle and grapes measure 7.5 inches high by 4 inches wide. 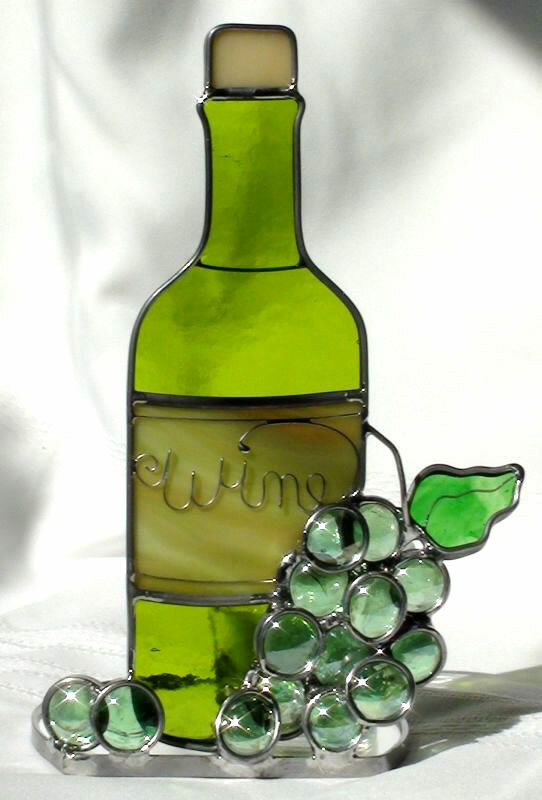 The green wine bottle and grapes back lit by soft candle light is perfect for wine lovers or any wine themed décor. The word "vino" is written on the label with wire. A companion piece to the standing candle is the hanging wine bottle and grapes. 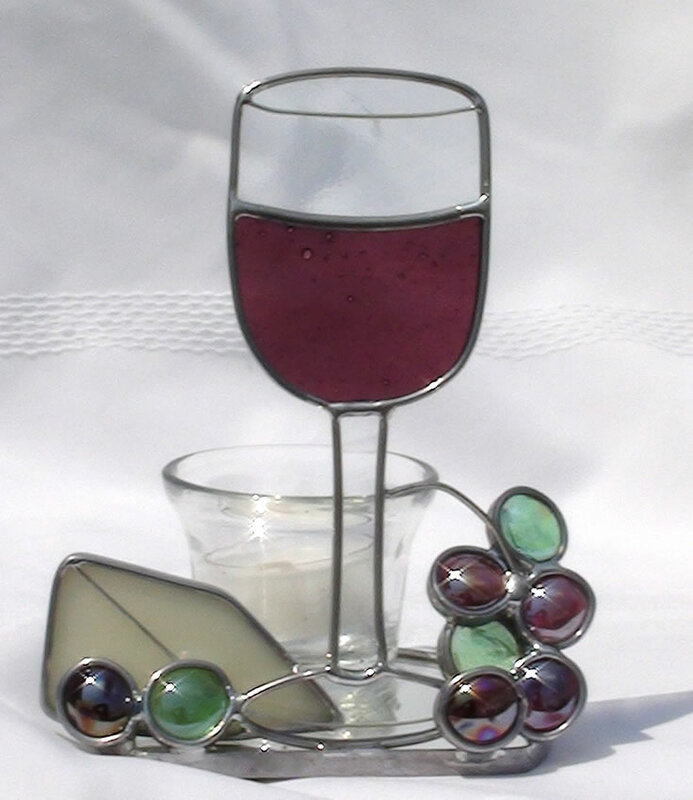 These items are also available in amethyst and the word "wine" can be depicted in wire on the label. Additional items can be found in other listings. 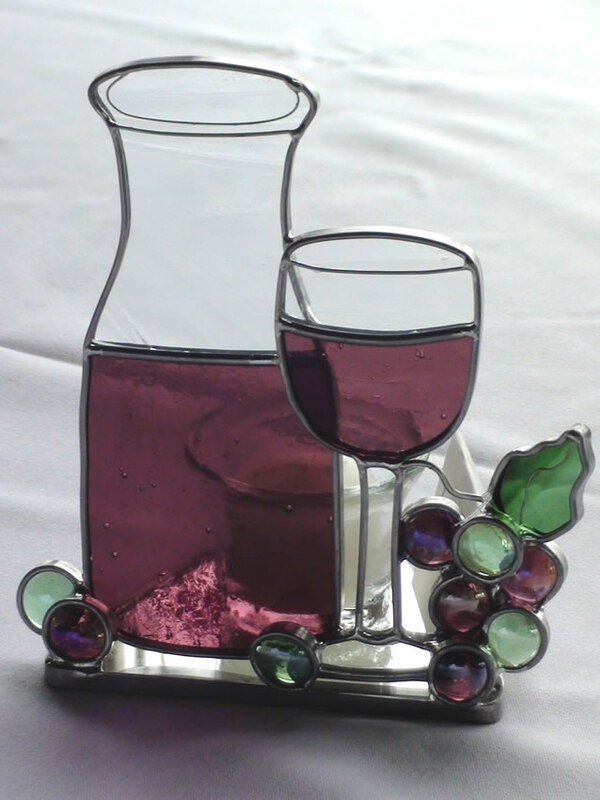 Description: This 5 inch x 7 inch amethyst wine carafe and glass with grapes, stand on a 5 inch mirror base in front of a votive candle. The clear glass of the carafe subtly reflects light with a delicate swirl. The carafe and glass are half full of amethyst colored wine while green and amethyst grapes are draped around the glass. A complement to this piece is the hanging version available in a separate listing. 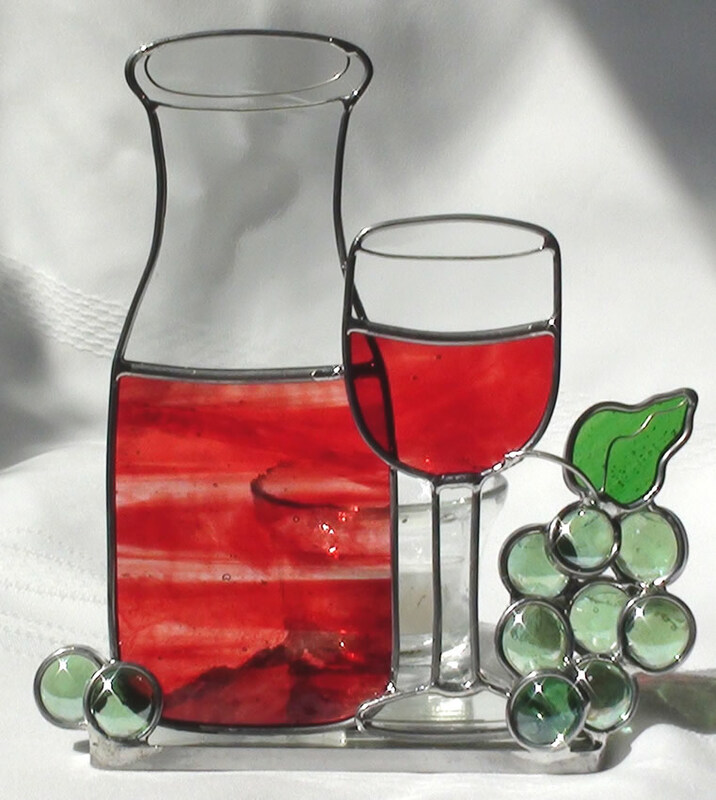 Great for wine lovers or wine themed décor. These items are also available in burgundy and can be found in separate listings. Description: This 5 inch x 7 inch burgundy wine carafe and glass stand on a 5 inch mirror base in front of a votive candle. The clear glass of the carafe subtly reflects light with a delicate swirl. The carafe and glass are half full of burgundy colored wine while green grapes are draped around the glass. A complement to this piece is the hanging version available in a separate listing. Great for wine lovers or wine themed décor. These items are also available in amethyst and can be found in separate listings. Description: Perfect for wine lovers and wine themed décor, this leaded stained glass candle measures 4 inches wide x 6 inches high. A half full glass of amethyst wine and a wedge of cheese draped with amethyst and green grapes stand on a 5 inch mirror base, back lit with the soft glow of a votive candle. This item is also available in burgundy. Both colors are also available as a hanging sun catcher. Other wine themed companion pieces can be found in separate listings. Description: Perfect for wine lovers and wine themed décor, this leaded stained glass candle measures 4 inches wide x 6 inches high. A half full glass of burgundy wine and a wedge of cheese draped with green grapes stand on a 5 inch mirror base, back lit with the soft glow of a votive candle. This item is also available in amethyst. Both colors are also available as a hanging sun catcher. Other wine themed companion pieces can be found in separate listings.